Wang Mingdao was born in Beijing during the Boxer Rebellion. His mother named him "Iron"&mdash;a name that foreshadowed his courageous life. He became a Christian at the age of 14 and later gave up his dream of being a politician to devote himself to Christian ministry. At one point he retreated to Beijing’s western hills and read the Bible though six times in 62 days&mdash;giving him a deep love for Scripture that grounded his preaching. Wang worked to build an independent church with its own leaders, its own financial support, and its own evangelistic efforts. 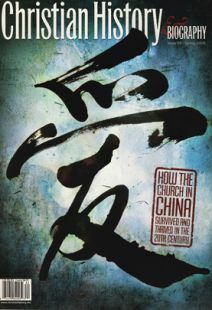 By 1949, his Christian Tabernacle (originally a small household gathering) had grown to 570 members, making it one of the largest evangelical churches in Beijing. Wang became widely known as an evangelist and speaker across China. He emphasized doctrinal purity and took a firm stand against any form of political involvement, believing the church and the state to have separate functions. Only the gospel could save his people. During the Sino-Japanese War (1937-45), Beijing fell under the control of the Japanese army, which sought to control the churches of North China. Wang was invited to join the Japanese-led Chinese Christian Federation of North China, but he declined on the grounds that his church was already an indigenous church, not pro-British or pro-American. The Japanese threatened him so many times that he kept a coffin in his house to prepare for the possible consequence of his stance. But the authorities took no action against him. This amazing turn of events, interpreted by Wang as divine protection, strengthened his willingness to be a martyr. When the Communists came to power in 1949, Wang continued to stay away from politics and refused to join the Three-Self Patriotic Movement. His reasons were not political but theological: Many in the TSPM had been influenced by modernism, which denied the inerrancy of the Bible and the miraculous elements in it. He wrote articles arguing that the so-called "imperialist poison" of the missionaries was for the most part the truth of the Bible: "We are ready to pay any price to preserve the Word of God … Don’t give way, don’t compromise!" For such nonconformity, Wang, his wife, and other young Christians from his church were arrested at gunpoint in 1955 and taken to prison. After being confined in a prison cell for a period of time, Wang cracked and signed a statement confessing that he was criminal and promising to join the TSPM. He was released, but he felt he had betrayed Christ like the apostle Peter and grieved bitterly. He revoked his previous confessions as forced lies, and for this he was imprisoned and tortured repeatedly for the next 22 years. Wang was released in 1979—;old, toothless, and nearly blind and deaf. He lived in Shanghai with his wife and son, and regularly held meetings with Christians in their small apartment until he died on July 28, 1991. He is widely recognized as one of the most influential and respected Chinese Christian leaders of the 20th century. Missionaries in China were hampered by pressures from home, mistakes in leadership, and identification with the West, but they planted the seeds that would someday yield an astonishing harvest.